For the first month of 2017, no team crossed the 200+ point plateau, proving that yes it is a rare occurrence... just incase you were getting used to seeing it happen. Even crossing the Sesquicentennial Mark wasn't easy in March, as only the number one team was able to do so. This is counter to the ten teams that had done do in the first two months of 2017! The Sesquicentennial Team for March 2017 were the Unusual Suspects, who topped the scoreboard with the top score at Cardinal Rule for the month, on March 22nd! 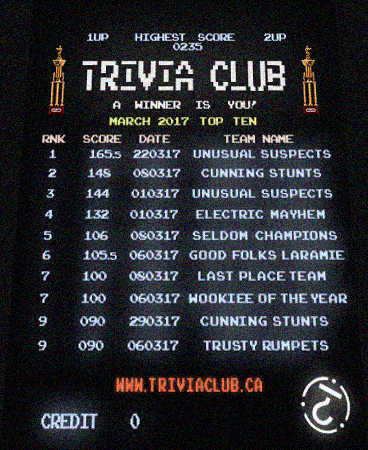 The High Score for March at Hitch belongs to the Good Folks from Laramie Cigarettes, who became just the third team to Threepeat at Trivia Club, and did so by just five and a half points against Wookiee of the Year on March 6th! Though they won their third consecutive VHS in March, The Good Folks continue an unexpected annual tradition of a team threepeating at Trivia Club MOSTLY during February! The Cunning Stunts were the first to Threepeat, doing so in February of 2015, the Electric Mayhem were the next to Threepeat, and did so during the last two weeks of February and the first week of March of 2016. This also gives Laramie Cigarettes the top score at Hitch for the second straight month! Three teams participating at Hitch are in the Monthly Scoreboard for March, with the other seven teams naturally participating at Cardinal Rule! The Electric Mayhem are the highest scoring team to not win a Golden VHS, a notation they also earned on last month's Scoreboard! This is the sixth consecutive month for the Cunning Stunts on the Monthly Scoreboard, and the fourth consecutive month for the Good Folks from Laramie Cigarettes. The Mean Team for March, the high score closest to the scoreboard average, are the Seldom Champions!